This is NOT just another green beans recipe. 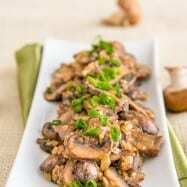 Adding soy sauce and sesame oil gives this dish a little Asian flare and the mushrooms… oh the mushrooms! While we are on that topic; this whole business of wiping mushrooms clean,… I can’t, I just cant! I think about all the people who might have touched those mushrooms and a whole bunch of other things that could have come in contact with them (I have a vivid imagination) and I have to wash them! 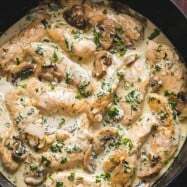 If you are one of those people who have to give your mushrooms a good rinse, don’t worry, it’s safe to do so in this recipe. Actually I usually do it. I’m a rebel (in my own mind). The only time I remember carefully wiping them was for stuffed mushrooms and I did buy an enclosed container that time. 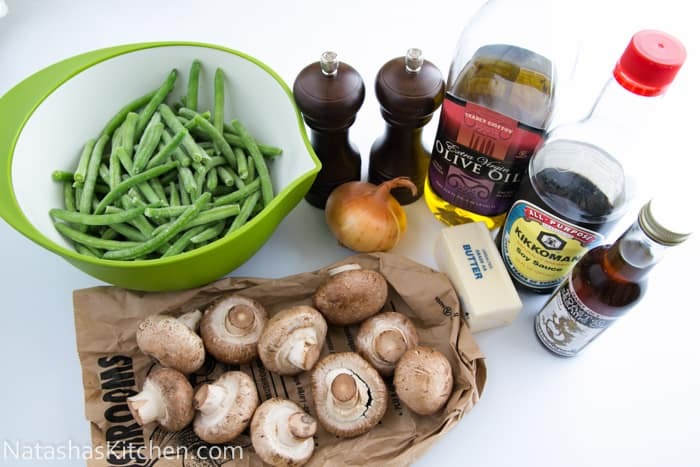 Back to this recipe: Greenbeans + Mushrooms = What’s not to love? 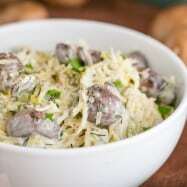 This is a very simple and delicious side dish, whether you are making it for your family or a bigger crowd. 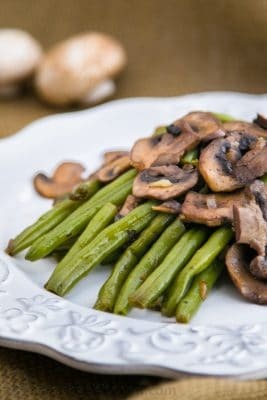 Green beans are most vibrant when served fresh, but they do reheat well. 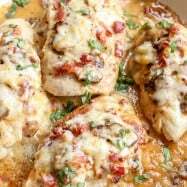 I love that you can use either fresh or frozen green beans in this recipe; we always have a bag from Costco in the freezer and that’s what we used; keepin’ it real. 1. If using frozen green beans, just follow the stove-top cooking instructions on the package. 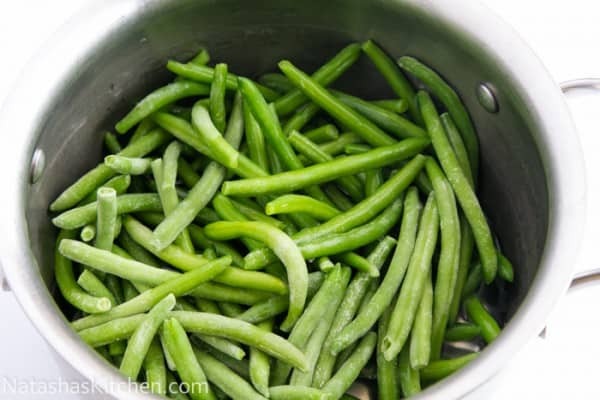 If using fresh green beans, snip the bases off on all the green beans (this is the only tedious part of the dish) Or you can just buy pre-cut beans which are a bit spendier. Fill a medium pot 2/3 with water and bring to a rapid boil. Add beans and boil 6 to 7 minutes, until crisp-tender. 2. Drain beans immediately and rinse them with cold water to stop the cooking process, set beans aside. 3. Heat a large skillet over med/high heat. Add 1 Tbsp olive oil and 1 Tbsp butter. Add mushrooms and onions and saute until tender (3-5 min). 4. Add cooked beans to the skillet and drizzle with 1 Tbsp soy sauce and 1 tsp sesame oil. Sprinkle with salt and pepper if needed, then stir everything to combine. Saute an extra minute, and it’s done. Adding soy sauce and sesame oil gives this dish a little Asian flare. 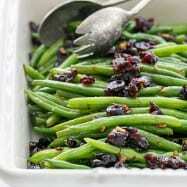 Green beans are most vibrant when served fresh, but they do reheat well. 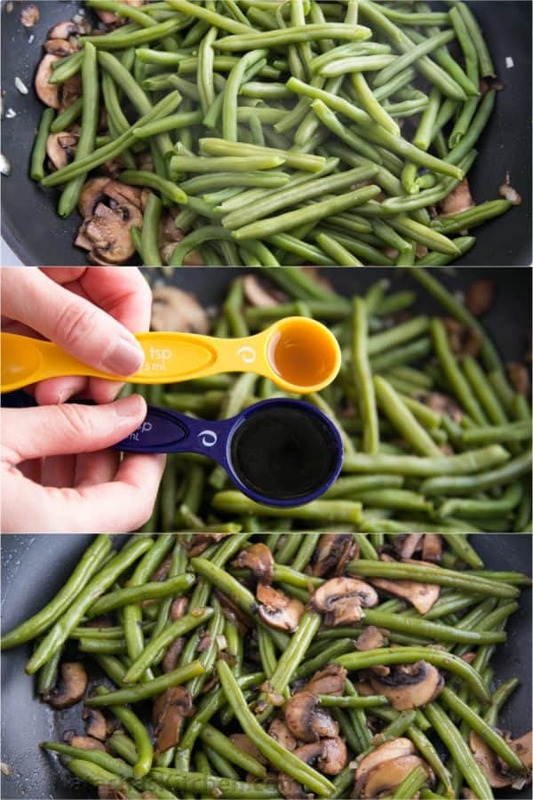 You can use either fresh or frozen green beans in this recipe. If using frozen green beans, follow the stovetop cooking instructions on the package. 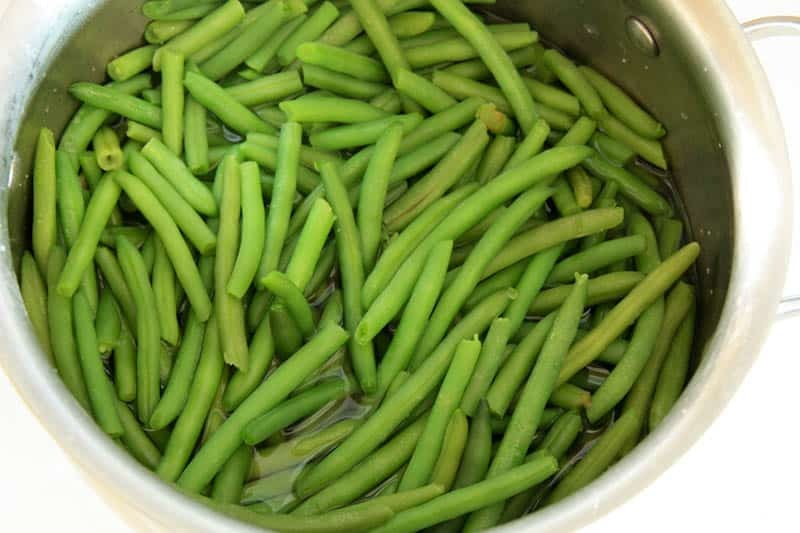 If using fresh green beans trim the ends on all the green beans (this can be tedious) Or you can just buy pre-trimmed beans which are a bit spendier. Fill a medium pot 2/3 with water and bring to a rapid boil. Add beans and boil 6 to 7 minutes, until crisp-tender. Drain beans immediately and rinse them with cold water to stop the cooking process, set beans aside. Heat a large skillet over med/high heat. Add 1 Tbsp olive oil and 1 Tbsp butter. 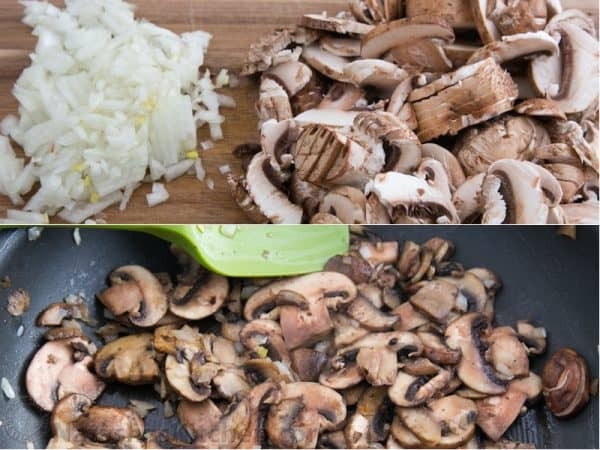 Add mushrooms and onions and saute until tender (3-5 min). Add cooked beans to the skillet and drizzle with 1 Tbsp soy sauce and 1 tsp sesame oil. Sprinkle with salt and pepper if needed, then stir everything to combine. Saute an extra minute, and it's done! 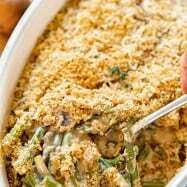 I was looking for green beans recipe on your website and came across this. I will definitely try it. 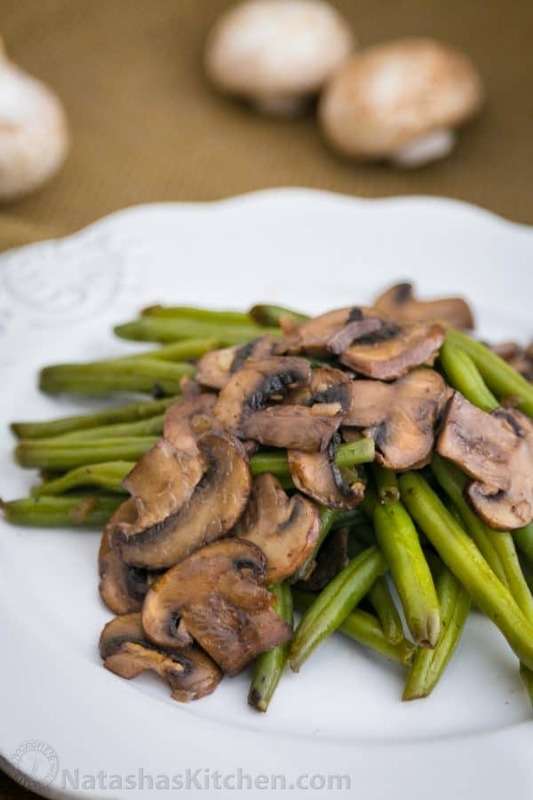 Green beans + mushrooms… what’s not to love? Thanks for the recipe!